As an auto body repair shop offering services locally, appearing in Google Maps Local 3-Pack is THE most important thing you can do to increase phone calls, leads and customers as you will learn in this guide. The 3-Pack is a group of three local businesses that appear at the very top of Google search listings, or just below a section of paid advertisements. The 3-Pack ranks in the #1 position in 93% of Google searches, according to a study by seoClarity (link: https://www.seoclarity.net/how-googles-local-pack-update-has-reshaped-the-organic-landscape-12952/). This makes the 3-Pack an absolutely essential location for your businesses because it quickly reveals to searchers that you are the most relevant, especially when combined with the right review profile. In other words, it provides an at-a-glance snapshot of your business in a busy world where people making buying decisions based on a) whether they can find your business at all and b) what others are saying about you. But being ranked highly in the 3 pack goes beyond just visibility or maps ranking for maps ranking sake. In fact, it directly ties into a buying decision. Research by Google (link: https://www.thinkwithgoogle.com/marketing-resources/micro-moments/purchase-decision-mobile-growth/) shows that 76% of people who conduct a local search contact a business within 24 hours, and 28% of those searches result in a purchase of a service. So, when you are ranked highly within the 3-Pack, you are on your way to more phone calls and increased sales of your services. As shown below, the 3-Pack does a few things. From their phone, customers can click on your business’s name, which gives customers more information about your company, including a click-to-call button. Or, customers can use a click-to-call button directly from the 3-Pack results. Click to call is essential to the growth of your business because a Google study (link: https://www.thinkwithgoogle.com/consumer-insights/click-to-call/) shows that 70% of mobile searchers click-to-call a business from Google results. In a world of constant smart phone usage, your customers want a way to push a button and instantly be connected to your business. 2) Reviews and a lot of them. Nothing will get a potential customer to act faster than a lot of glowing reviews. On the other hand, a lack of reviews or negative reviews can be damaging to your business. You can pay for ads through Google AdWords, be ranked highly in the 3-Pack, or be one of the top 10 organic listings below the 3-Pack.Because your advertising budget is vital to the success of your business, you may be wondering which section gets the most attention though? The 3-Pack is the clear winner. Why? It is consistently noticed more often when it comes to local searches. Google ads fall behind both the 3-Pack and the top 10 organic results because people don’t find paid ads to be trustworthy or relevant in search engine results. A study by Search Engine Watch (link: https://searchenginewatch.com/sew/opinion/2423578/google-local-pack-is-233-percent-more-important) found that 68% of searchers prefer the local 3-Pack, 27 percent prefer the organic results below the 3-Pack, and only 10 percent trust paid search results. As you can see, if only one of 3 spots available garners 68% of all searcher’s trust, the 3 pack is an absolute must. Also, paid search results often provide little return on investment because the average cost per click is very high and growing every year, with some popular keyword-clicks costing as much as $50 or more. Also, companies that use AdWords see a very low click-through rate of 2% or less according to WordStream. Even if you manage to get a decent number of clicks, the average conversion is dismal at 2-3% on the high end. That means you would need about 100 clicks to get just 2-3 phone calls. Not very appealing right? So, Google users skip paid ads and move straight to the 3-Pack to determine which business they should contact. Will it be yours? And if 2 % of all clicks and a 2-3% conversion rate doesn’t sound appealing, how about 44%? The 3-Pack receives the majority of actual clicks on a results page, at a 44% rate, according to Moz (link: https://moz.com/blog/the-new-snack-pack-where-users-clicking-how-you-can-win). The results are below. The Moz study shows that searchers like the 3-Pack the most. The results also found that searchers were less likely to click on the business website link or directions. Instead, they clicked on the business name itself, which sends customers to a Google My Business listing where they can find the business’s phone number. And recall from above, that your potential customers make actual buying decisions from the 3 pack. 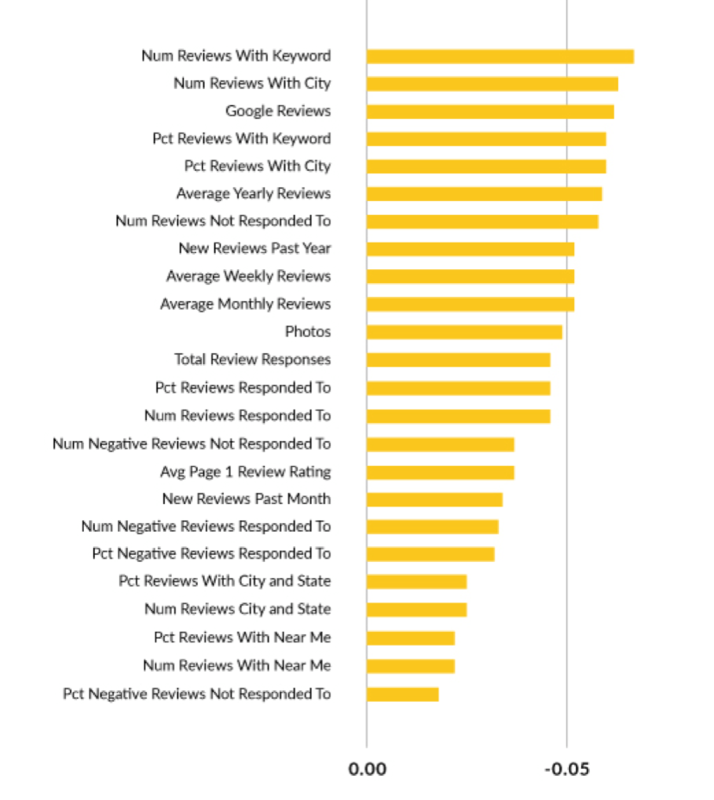 It’s important to note that businesses that did not have reviews received no interest at all from searchers (more on the importance of reviews below). The study showed that positive reviews are vital to spark customer interest and are a must to be noticed within the 3-Pack. Finally, this study along with the next one shows that companies with the highest rating in the 3-Pack received the most attention. Though the organic listings in the second study represented 40% of the clicks and finished first, the 3-Pack finished second with 33% percent of customer interest. See the heat map below. The first company in the 3-Pack is the same as the first company in the organic search results below it. The company received most of the attention likely because of its top spot in both categories. Although, the second listing in the 3-Pack got a lot of attention as well because it has a 5-star status. The two top companies in the 3-pack received most of the attention on the page, and the business with no reviews did not receive any interest at all. Again, it is worth pointing out that the 3-Pack clicks land on the business name itself, where users can find the company’s phone number. So while organic received a few more clicks in this study, it is likely that less phone calls resulted from those clicks. Why? Your potential customers place a huge emphasis on third party reviews, which typically don’t appear on a website and when they do are less trustworthy. Furthermore, after reading reviews, your potential customers are visiting your website less and less, and instead making their decision based on those reviews (see the Bright Local study later in this report). Customer reviews have a big impact on the behavior of customers and the performance of a company’s brand. Reviews may quite literally make or break sales of services, and the quality and quantity of online feedback plays a huge role in a company’s bottom line. According to a survey by BrightLocal (link: https://www.brightlocal.com/learn/local-consumer-review-survey/), 88% of consumers read online reviews, and 85% of people trust them just as much as a personal recommendation. So, a lack of user reviews on Google and other crowd-sourced review websites like Yelp, or ignoring consumer reviews as a potential marketing opportunity means that a company is excluding a whopping 88% of the buying community. In other words, consumers want to read reviews to help them with their buying decisions, and your business loses an opportunity to attract customers when they are deprived of them. While location and price can be important factors in choosing a local business, no other factor is more important than positive customer reviews. Research shows that 68% of customers are more likely to use a local business after reading positive reviews, while 40% of customers go to competitors when they read bad reviews. The average number of stars that a company receives makes a huge impression on customers and influences the rate at which they contact a company in the 3-Pack. Listings with five-star reviews earned 69% of the attention on the 3-Pack, while four stars earned 59% of the attention, and three stars earned 44%. Also, the number of reviews is important for consumer trust. Customers read as many as 21 or more reviews before making a purchase of services. The normal range is between 2 and 10 reviews, making up 83% of consumer needs, but 7% read 11-20 reviews, and 6% want feedback that exceeds 20 reviews. So, businesses that have less than 11 online reviews are missing an opportunity to get the attention of 13 percent of the buying population. That is huge. Online reviews are also important because they can somewhat influence a business’s ability to rank in the Google 3-Pack as well as in the organic or natural search engine results. There is also some speculation that reviews on other third-party review sites can help you rank better as well. According to Forbes (link: https://www.forbes.com/sites/jaysondemers/2015/12/28/how-important-are-customer-reviews-for-online-marketing/2/#690892d66027), Google uses information from many third-party directories and review sites, such as Yelp. Whether Google only factors in Google reviews or third-party reviews as well, the bottom line is that the more positive reviews you have, the higher your chance becomes at ranking in Google’s 3-Pack, and not below the 3-Pack line, where you will find a link to “More places”. You do not want to be in this spot because you completely lose visibility. The buying public simply doesn’t look beyond the 3 pack. While ranking in local organic search results (the results that appear just below the 3 pack) continues to be a top factor in whether a company will rank in the 3 pack (typically depending on many variables not discussed here), a well optimized website and reviews dominated all other factors, according to Local SEO Guide (link: http://www.localseoguide.com/guides/local-seo-ranking-factors/). Why do reviews help? Reviews help Google to use a number of signals for its ranking factors, and reviews help Google’s search engine to determine trending businesses, which can increase a company’s ranking. This works because reviews have date stamps, so current customer engagement is visible to the engine. That is why you will observe in the graph below that average weekly and monthly reviews, as well as new reviews in the past month, play a big role in the search results placement within a 3-Pack. The bottom line on reviews? 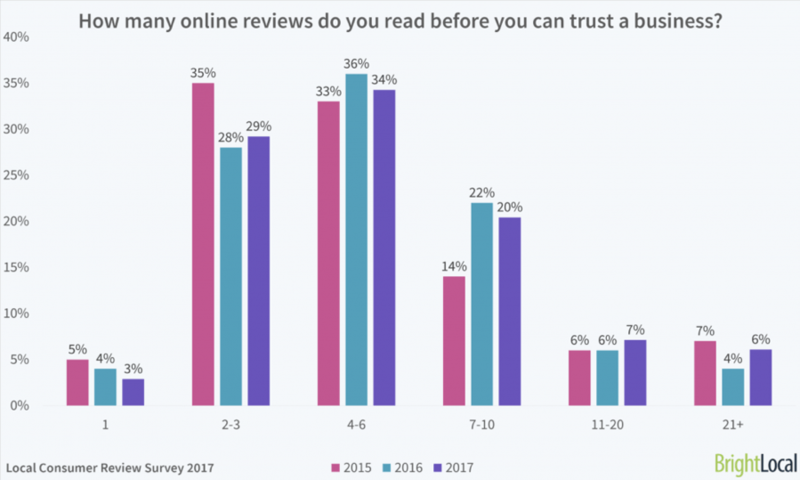 The importance of online reviews is rising in every important customer category, and numerous surveys indicate that consumers want reviews when making a buying decision. Also, Google’s search results use consumer reviews when determining rankings factors for the 3-Pack. User reviews are important, and that will not change. So, the longer you wait to start optimizing your reviews, the more you stand to lose. Online shoppers demand reviews and they are responsible for better online visibility and ranking in organic search results and within the 3-Pack. Websites Are Becoming Less Of A Factor. A Bright Local study conducted for the past several years shows a trend that simply can’t be ignored. Consumers are relying less and less on websites to determine if they will do business with you or not. What does this mean for you? You must start to work with a digital marketing company whose top priority is to understand that consumers are visiting websites less every year and instead are relying on visibility and a solid review profile to determine if they call you, or come in to your place of business at all. It’s that important. Most digital marketing companies are only focused on ranking websites in the organic search engine results or managing an Adwords campaign. None of these have the trust, visibility and attention of your potential customer like the 3 pack does. Appearing in the Google Maps Local 3-Pack is the first step to attracting attention to your brand and encouraging people to call your business. Work to create a superior Google 3 pack presence, and look sharp and relevant with lots of positive reviews, or suffer defeat at the hands of perceptive business owners who compete with you and are already heavily leveraging these factors. Ready To Get More Phone Calls?